Published: Jan. 12, 2013 at 10:03 a.m. 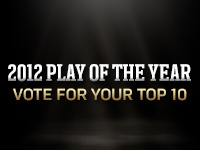 Updated: Jan. 12, 2013 at 12:08 p.m.
Peterson was a unanimous selection. Lynch clearly was the second-best running back in the league but "only" got 24 votes. His power is second to none. It's great to see Charles' recovery from knee surgery and Morris' outstanding rookie season recognized here. Leach helped Ray Rice and Bernard Pierce develop into one of the best 1-2 combinations in the league for the Baltimore Ravens. It's too bad Marcel Reece of the Oakland Raiders didn't get any love, but it's hard to argue with Leach and Felton as the picks. So much for the new generation of tight ends. Gonzalez's numbers exceeded any other season he had for the Atlanta Falcons. Witten set his career high in receptions. Rob Gronkowski's injury cost him a spot here; I can't argue with that. Megatron received 49 of 50 votes. I want to know the writer who didn't vote for him. These four receivers stood out as the best this season, and no one else got more than one vote. Green might be a better player than Marshall, but the Chicago Bear had the better season. This is why we like the All-Pro Team: All these picks make sense. Brown has established himself as the best left tackle in football. Staley came on strong after a rough Week 1 against Clay Matthews. Deserving starters, but this probably is the position where we writers are just guessing the most. Iupati had a breakout season as a mauler for the San Francisco 49ers. Mankins really did not have a great season, but he coasted on his name. Really, how many writers are breaking down film on interior linemen? We should let coaches choose the All-Pros at this position. Mike Pouncey, Maurkice's brother, was overlooked here. Unger is a worthy choice for a sneaky good Seattle Seahawks offensive line. Also: No Jeff Saturday. Watt was a unanimous selection, and Wake easily took the other spot. Easy picks. Peppers snuck on to the second team despite a down season because there really wasn't another obvious fourth end. Atkins could have been a NFL Defensive Player of the Year candidate in most seasons. Smith is so good he made the second team at two positions. Ngata did not have a good season, and anyone who voted for him wasn't paying attention. Guys like Henry Melton and Gerald McCoy received votes and would have been better picks than Ngata. Suh quietly had his best pro season despite the lack of hype. The second team was bigger because the last three names tied with one vote. Miller, Smith and Watt figure to be among the best defensive players in the NFL for the next decade. I'm surprised Ware received so little love, but the top two picks here were easy. Bowman just edged out Washington for the second first-team spot. I liked Washington a little better this season because of his blitzing, but Bowman is worthy. Sherman said the All-Pro Team mattered more than the Pro Bowl and that he would make the first team. He proved correct. Writers only judged Sherman on his excellent play on the field. Sherman and Tillman easily were ahead of the pack at the position. It's insane that Patrick Peterson made the Pro Bowl team ahead of Sherman. I'd flip the first team and second team here, but at least Weddle and Byrd were recognized after missing the Pro Bowl. As a rookie, Walsh had one of the greatest kicking seasons in NFL history. Jones made the Houston Texans miss him. His celebrations were All-Pro caliber, too. Lee is excellent year after year. Quarterbacks: Peyton Manning, Denver, 43; Aaron Rodgers, Green Bay, 4; Tom Brady, New England, 3. Running backs: Adrian Peterson, Minnesota, 50; Marshawn Lynch, Seattle, 24; Alfred Morris, Washington, 14; Jamaal Charles, Kansas City, 7; Arian Foster, Houston, 3. Fullbacks: Vonta Leach, Baltimore, 26; Jerome Felton, Minnesota, 12; Marcel Reece, Oakland, 4; Michael Robinson, Seattle, 3; Mike Tolbert, Carolina, 2; Bruce Miller, San Francisco, 1; John Kuhn, Green Bay, 1. Tight ends: Tony Gonzalez, Atlanta, 24; Jason Witten, Dallas, 19; Rob Gronkowski, New England, 4; Jimmy Graham, New Orleans, 2; Heath Miller, Pittsburgh, 1. Wide receivers: Calvin Johnson, Detroit, 49; Brandon Marshall, Chicago, 23; A.J. Green, Cincinnati, 16½; Andre Johnson, Houston, 8½; Demaryius Thomas, Denver, 1; Wes Welker, New England, 1; Julio Jones, Atlanta, 1. Offensive tackles: Duane Brown, Houston, 27; Ryan Clady, Denver, 19; Joe Thomas, Cleveland, 17; Joe Staley, San Francisco, 11; Russell Okung, Seattle, 6; Andre Smith, Cincinnati, 5; Trent Williams, Washington, 5; Anthony Davis, San Francisco, 3; Tyson Clabo, Atlanta, 2; Phil Loadholt, Minnesota, 2; Eric Winston, Kansas City, 1; Matt Kalil, Minnesota, 1; Sebastian Vollmer, New England, 1. Guards: Mike Iupati, San Francisco, 38; Jahri Evans, New Orleans, 23; Marshal Yanda, Baltimore, 17; Logan Mankins, New England, 7; Evan Mathis, Philadelphia, 5; Josh Sitton, Green Bay, 5; Alex Boone, San Francisco, 2; Chris Snee, New York Giants, 2; Wade Smith, Houston, 1. Centers: Max Unger, Seattle, 16; Maurkice Pouncey, Pittsburgh, 10; Chris Myers, Houston, 7; John Sullivan, Minnesota, 7; Mike Pouncey, Miami, 7; Nick Mangold, New York Jets, 2; Eric Wood, Buffalo, 1. Kickers: Blair Walsh, Minnesota, 42; Phil Dawson, Cleveland, 4; Sebastian Janikowski, Oakland, 3; Dan Bailey, Dallas, 1. Kick returners: Jacoby Jones, Baltimore, 37½; David Wilson, New York Giants, 3; Leodis McKelvin, Buffalo, 2½; Leon Washington, Seattle, 2; Darius Reynaud, Tennessee, 2; Randall Cobb, Green Bay, 1; Marcus Thigpen, Miami, 1; Josh Cribbs, Cleveland, 1. Defensive ends: J.J. Watt, Houston, 50; Cameron Wake, Miami, 28; Justin Smith, San Francisco, 6; Julius Peppers, Chicago, 5; Chris Clemons, Seattle, 4; Jared Allen, Minnesota, 3; Elvis Dumervil, Denver, 1; Aldon Smith, San Francisco, 1; Charles Johnson, Carolina, 1; John Abraham, Atlanta, 1. Outside linebackers: Von Miller, Denver, 48; Aldon Smith, San Francisco, 47; Chad Greenway, Minnesota, 2; Ahmad Brooks, San Francisco, 1; Clay Matthews, Green Bay, 1; DeMarcus Ware, Dallas, 1. Inside linebackers: Patrick Willis, San Francisco, 30; NaVorro Bowman, San Francisco, 26; Daryl Washington, Arizona, 20; London Fletcher, Washington, 7; Luke Kuechly, Carolina, 5; Jerod Mayo, New England, 4; Lawrence Timmons, Pittsburgh, 3; Derrick Johnson, Kansas City, 2; Lance Briggs, Chicago, 1; Bobby Wagner, Seattle, 1. Cornerbacks: Richard Sherman, Seattle, 39; Charles Tillman, Chicago, 37; Tim Jennings, Chicago, 8; Champ Bailey, Denver, 8; Patrick Peterson, Arizona, 5; Antonio Cromartie, New York Jets, 3. Safeties: Earl Thomas, Seattle, 28; Dashon Goldson, San Francisco, 20; Eric Weddle, San Diego, 19; Jairus Byrd, Buffalo, 7; Stevie Brown, New York Giants, 6; Ed Reed, Baltimore, 3; Thomas DeCoud, Atlanta, 3; Donte Whitner, San Francisco, 2; T.J. Ward, Cleveland, 2; Ronde Barber, Tampa Bay, 2; William Moore, Atlanta, 1; Eric Berry, Kansas City, 1; Reshad Jones, Miami, 1; Devin McCourty, New England, 1; LaRon Landry, New York Jets, 1; Morgan Burnett, Green Bay, 1; Reggie Nelson, Cincinnati, 1; Tyvon Branch, Oakland, 1. Punters: Andy Lee, San Francisco, 24; Thomas Morstead, New Orleans, 18; Dustin Colquitt, Kansas City, 5; Britton Colquitt, Denver, 1; Brandon Fields, Miami, 1; Brian Anger, Jacksonville, 1.